I was 19 years old and was back home in Georgia following my first year away at college. It had been a transformative year for me in many ways. I had left my family to go to school in Dallas, with all the adjustments a teenager endures living in a dorm and being on their own for the first time. Back at home with my family I was anxious to share my new experiences with them. My mom and I talked for hours about my roommate and my classes, the new friends I’d made and my excitement about the coming year. I was going to study in Rome and we were both anticipating my trip. But I hadn’t told my family everything about that first college year. In fact, the most important thing that had happened to me was something I found difficult to share with them. I wanted to become Catholic. I was afraid my parents would disapprove. I was afraid to tell my mother, most of all. She was a woman of strong opinions who was never shy about sharing them—a kind of force of nature. And though I’d never heard her voice anything at all against the Catholic Church, I also couldn’t imagine her embracing my decision. For us and our Baptist background, being a Catholic was so foreign that it just didn’t exist as an option. Until I was in high school, I’d never even met a Catholic. I’d certainly never been drawn to explore Catholicism. But I’d also never formally joined our Baptist church either. My college was a Catholic one and my experience of the Church was life-changing. I was torn between my joy and my hesitation to talk about it with my family. Finally, my best friend tired of me talking to her about it, and she told my parents for me. What a relief! They were supportive and wanted my happiness, as good parents always do. Unfortunately, none of us knew what to do next. In those years before google, there was no easy place to go for answers. So the next morning, I looked in the phone book and called the nearest Catholic Church. I must have called twenty times that day without getting an answer. I drove to the church, determined to find out how a person could become Catholic. But the doors were locked and the only information I could find was the Mass schedule on a sign outside. That evening I showed up for Mass and told the pastor what I wanted to do. He was kind and soft-spoken and suggested we meet in his office the next afternoon to talk things over. We did. And over the course of just a few weeks of reading and conversation with him, we scheduled my Baptism. With my family around me, I was baptized and confirmed on a Saturday afternoon. The next day I made my First Holy Communion. 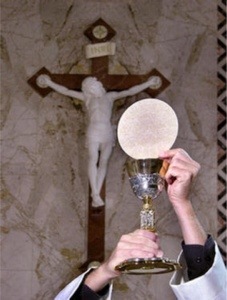 It was the presence of Christ in the Eucharist that drew me to the Catholic Church and 33 years later, the Eucharist remains the heart of my faith. Thankfully, becoming Catholic nowadays is a bit more transparent. Like most parishes, our church has a program for people wanting to explore the Catholic faith. Called the Rite of Christian Initiation for Adults (RCIA) it’s both a learning experience and a spiritual journey. But whether you “cross the Tiber” in an RCIA group, or through personal instruction like me, the destination remains the same–coming home to the Church founded by Jesus Christ. Thanks be to God! “And there were in the same country, shepherds abiding in the fields, keeping watch over their flocks by night” (Luke 2:8). It was the shepherds outside of Bethelehem who first heard the news of Christ’s birth. These men and boys often lived at the edge of society, doing hard and lonely work in all sorts of weather. In many ways, the shepherd was the “average working-class Joe” of Jewish life. To some people, being a shepherd was among the lowest kinds of work. It was physically demanding but vital to the economy of the Jews. Shepherds lived mostly in the wild with only a wool wrap and a simple cover to protect them from rain, wind, scorching heat and freezing cold. Shepherds ate only what they could carry: bread, cheese, olives and if they were lucky, some figs and raisins. They had to be versatile and adaptable to all kinds of situations; ready to rescue any strayed sheep and carry any injured one back to safety to nurse it to health. Dangerous predators roamed the hills around Bethlehem and shepherds armed themselves with slingshots and heavy mallets to ward off the attacks of bears, lions, wolves and jackals. Sometimes they would pull thickets of thorns and brambles together to make a pen for their sheep at night. The shepherd would then lie down in the gate opening to close it off and protect his flock. The Bible is full of references to sheep and shepherds. Old Testament saints like Abraham, Isaac, Jacob, Moses and David were all shepherds at one time or another. Jesus as our “Good Shepherd” is a beautiful image from Sacred Scripture. In our time, the words “pastor” and “bishop” both derive from ancient words meaning “shepherd” and “guardian” and the staff of the bishop is still the shepherd’s crook. It was appropriate then, that shepherds became the first Christmas guests. 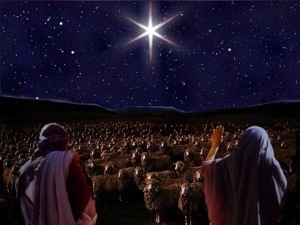 We don’t know the names of the shepherds out on the hill that night with their flock surrounding them. Because they were just those “average Joes” working the night shift, their legacy is anonymous. But for a moment, try to imagine what it must have been like for them. It’s a cold, quiet evening, talking with your friends around a fire. The conversation always seemed to come back to the Romans, to politics. Occasionally, the bleating of a sheep causes eyes to scan the hills for any sign of wolves. Not tonight. No, it’s just another cold quiet night on the job. And then—–LIGHT! Not just the light of daylight, but daylight a million times over! The night sky blazes with an army of huge, shining men in armor surrounding and overwhelming them with their light and song. “Do not be afraid,” the clear and beautiful voice rings out from the one closest to the shepherds. “A Savior has been born to you!” The angels spread out their arms and the glory and radiance of heaven is spilled out over the whole sky. “Glory to God in the highest!” rang out the thunderous cry of the army of God. The joy of heaven flowed down to earth that night and into the lives of the shepherds of Bethlehem. For our great and almighty God has the heart of a shepherd. So it was fitting that shepherds be the first to know. And what did the shepherds do? They didn’t stop to debate what it all meant, to argue over theology or form a committee. No. They ran. They ran to the manger, ran to meet their King, ran to the Baby, to fall down on their knees and worship Him, Emmanuel, God Is With Us. May we all have the heart of a shepherd this Christmas season. Even though we’re still in the season of Advent, you can’t help but hear Christmas carols playing everywhere you go. Some of them are of the traditional variety and invoke sacred images of the coming of our Savior. “O, Holy Night” is my favorite, never failing to give me chills when I hear it. Others are more secular in nature but still echo the joy of late December and our celebrations. “Jingle Bells” and “Let It Snow” are examples of these. Over the years, newer songs are added to our cultural Christmas playlist. Back in 1984, an evangelical comedian (whatever that is) named Mark Lowry was asked to write the words for a song that was to be used in his church’s Christmas program. The song he wrote was “Mary, Did You Know?” and since that time it’s been recorded by several artists. Now it’s a popular Christmas standard, telling the story of Jesus’ birth and purpose through the eyes of the Blessed Virgin Mary. I think this is a good thing because here in the mostly-protestant South, Mary is rarely the subject of much serious contemplation, either in hymns or sermons. Before I entered the Catholic Church, the only time we thought about Mary was on Christmas Eve. She was very much a minor background player in my Baptist theology—maybe slightly more important than the shepherds or lambs but, like them, she never had any lines in our Christmas plays. She was just sort of “there,” a kind of biological necessity for the birth of Jesus. And as soon as the last carol had ended, Mary disappeared from our thoughts until the next Christmas. The song, “Mary, Did You Know?” asks a lot of questions about what the Mother of God knew about her Son and what His life would hold. It’s a sweet song, but I have to wonder if Mr. Lowry has read Holy Scripture. If he has, he’d encounter what the Angel Gabriel told Mary when he came to her at the Annunciation. “Behold, you shall conceive in your womb and bear a Son and you shall call Him Jesus. He shall be great and men will know Him as the Son of the Most High; the Lord God will give Him the throne of His father, David and He will reign over the house of Jacob eternally and His kingdom shall never have an end…the Holy Spirit will come upon you and the power of the Most High will overshadow you. Thus this holy Child of yours shall be known as the Son of God” (Luke 1:31-35). Mary did indeed, know. She knew she was to give birth to the Son of God. As a faithful Jew, Mary knew exactly what that meant. The Messiah had been prophesied for centuries and she knew all that the prophesy entailed. How much Mary knew and understood is reflected in her beautiful hymn of praise, the Magnificat, which she proclaimed upon her visit to her cousin, Elizabeth. It includes: “From now on all generations will call me blessed…”(Luke 1:46-55). Elizabeth had praised Mary’s great faith in saying “yes” to God’s plan. Upon her arrival, Elizabeth had said to her: “How does this concern me, that the mother of my Lord would come to me?” (Luke 1:43). Elizabeth knew, too. So enjoy the song, but answer each “Mary, Did You Know?” query with a resounding, “Yes!” Mary knew. She might not have known all the details of how her Son’s life would unfold, but she knew Who Jesus is and His great purpose. God may have revealed much more to her privately than we know from Scripture. It’s hard to imagine that the best Jewish mother of all time wouldn’t have known the big picture. From a Catholic viewpoint, the Blessed Virgin is our own Mother and through her “yes” Salvation came to us. Her life is our model of humility, faith and love of Christ. She longs to lead souls to her Son and will do this for anyone who asks this of her. 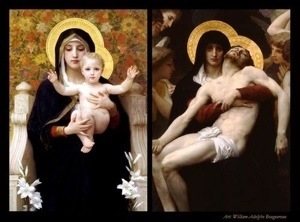 Jesus chose the Blessed Virgin Mary to be His own mother. We can never love her more than He already does. Yes, Mary knows. For as long as I can remember, my little hometown has celebrated Christmas by illuminating a huge star perched on the mountain above the downtown streets. The weeks leading up to Christmas are marked with the appearance of that star. Visible for miles, the star glows in the winter sky like a beacon signaling the season. Back in my college days, I’d come home for Christmas anticipating that star and it was always so comforting to see it there. In a way, it really made me feel like I was finally home. The star at that first Christmas must have been an amazing sight. Maybe there’s a scientific explanation for it. Maybe not. What we know is that it was such a bright star, appearing so suddenly and giving so much light that astronomers in other countries saw it. Some of them even followed the star to Bethlehem where they found a Child. And whether they knew it or not, this Child was the true Light, the Light that calls each of us to come to Him. Yet our world seems so very dark at times. If Christ truly IS the Light, then why us there war and famine, oppression and injustice? Why haven’t we been able to find and share that peace that Jesus spoke about? The answer lies within each one of us. In our hearts, where sins are born. Original sin has wounded us all and makes us prone to sin. In that sense, sin is our natural state and it’s only through the gift of God’s supernatural grace that we can overcome it. And we all know how often we fail. Or maybe we don’t. Maybe we’re a bit blind and deaf to the darkness we carry around inside us. Advent is about the light of Christ—the Light that dispels the darkness of sin. The first two weeks of Advent are penitential weeks when the Church encourages us to repent and confess our sins. Most parishes have penance services in early December where the parish gathers together for prayer and Scripture readings before private, Sacramental confession with a priest. Before confession, we prepare ourselves through an examination of our consciences. Pray that the Holy Spirit will reveal your sins to you. Catholics often review the Ten Commandments as a guide. Whatever Scripture or spiritual reading you use it’s important to be truly honest and thorough. When you do, you’ll be ready for confession. And it’s in confession that you’ll have a personal encounter with the light of Christ. When Jesus instituted this Sacrament no one knew better than He did of our need for it. In His human life, Jesus witnessed all of the darkness of this sinful world. He saw injustice and oppression, murder and greed, self-righteousness and pain. He knew just how much we need reconciliation to His own Sacred Heart. When He appeared to his disciples in the Upper Room, they received the gift of the Holy Spirit and Christ spoke to them: “If you forgive the sins of any, they are forgiven; if you retain the sins of any, they are retained”(John 20:23). That power, received through the Sacrament of Holy Orders to priests and bishops over the centuries, is present in confession today. Christ’s forgiving grace is the Light of that first Christmas star. His grace dispels the darkness of our sins. The light of His mercy and love gives us the strength to follow Him each day. Without His grace, the darkness has won. 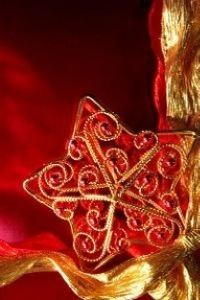 Are you ready for the Christmas star? Are you ready for Christ’s light to illuminate the dark corners of your heart? Or do you have sins in need of forgiveness? Every time I see the star on the mountain above our little hometown I think of that first Christmas star. I wonder how it would have felt to see the Child, to be in His presence, to have His eyes look into mine. I want to be ready for that moment. I want my heart to be pure and full of the love and mercy that He offers me, and each of us, in confession. Advent is the time to prepare ourselves for meeting the Lord. The light of Christ is on the way. Advent has begun. This season of joyful, hopeful waiting pulls us out of ourselves and towards the light of His birth. Advent is all about light. As the days grow shorter and the darkness seems to overtake us, a great Light is sent to lead us. I love the Scripture readings we hear during Advent. Each of them speaks to us of the coming light of our Savior. God’s great love for us bursts forth from heaven and we’re bathed in the uncreated Light of His Son, Jesus Christ. This light lives within each of us who are His followers. Jesus was foretold in Isaiah, proclaimed in St. John’s gospel and He called Himself “the light of the world” (John 8:12). But what does that mean? What does the star in the east, the candles in our Advent wreath, the haloes in the paintings of the saints or the lights on our Christmas trees—-what does all this light mean for us? Light reveals things. Light shows us what something looks like. The light of Christ reveals the truth of God which is His love for us. Light is the truth of God. Light chases away the darkness. When Christ lives in us, that light shines forth from us, too. 1. Speak well of others. Don’t gossip. Use your words to build others up, not to tear them down. This includes our online words on Facebook and Twitter, the jokes we share and the photos and links we post. Are we showing the way to the Light or are we adding to the darkness? 2. Be a servant. Give your time, your talent, and your treasure to help those who have less. Volunteer. Be that anonymous donor the food bank needs or the homeless shelter or the soup kitchen. 3. Take care of your family. Be kind and patient with the ones you love the most. You can’t reflect the Light of Christ if you’re abusive or neglectful of the people closest to you. Love begins at home. 4. Find one new way to pray. Shake up your comfortable prayer routine. If you’ve never prayed the Rosary, then start. Maybe non-verbal prayer has always challenged you. If it has, try again. How about praying the Liturgy of the Hours? Or a novena? Don’t be afraid to ask God to help you pray in a new way. 5. Attend one daily Mass each week. Your presence there is a testimony to Christ, our Light. The graces you’ll receive will allow His Light to shine through you. Mass, Adoration and Confession are the sources of the Light we can share with others. Advent prepares us for Christ’s coming, both at Christmas and at the end of time. Being Light to others is building the Kingdom of God. And that’s our calling and our purpose. These are some of the weeks each year when our families are the focus of our days. We travel to be with them, to give thanks, to share together in the bounty of God’s blessings. Our parents, our siblings and our children gather around the table with us. Or not. Families can mean many things. They can be made up of friends and neighbors, of those we choose to serve on this holiday, or maybe we have to be our own family this year. No matter who our family might be, family means love and mercy, a shared history, a community of acceptance, a safe place—home. Making a family is the work of our lives and having a large family is a calling, a vocation. A house full of children is a path to holiness. My niece Katie and her husband John have four children under the age of ten. I asked her for her thought about making a family and I’d like to share them here. “Before I had children I wasn’t maternal. I didn’t babysit, want to hold babies or become a teacher. I had a career and a ton of autonomy. When John and I married, I instinctively felt that having children was part of fulfilling what a marriage should be. I felt this way out of a love for my spouse, a desire to see what our children (us combined!) could be. What I didn’t realize is that for us having children would solidify our marriage bonds in a way I couldn’t have pictured. Both of our hearts expanded and the selfishness of our early married days was burned away. With each child, our bond grew as husband and wife. Four children has helped us define who we are as people by asking us who we want our children to be. A larger family has given our children a collective sense of identity and loyalty to each other. I see my children maturing in a way they couldn’t if they were only children or if there was one other sibling (who they might compete with). First, I simply can’t attend to everyone’s immediate needs. This helps the children learn to lend a hand to their siblings, to be patient when they have to wait, to go without, or to figure out how to do things on their own. They love pitching in and being my helper and they get fulfillment by helping a sibling who needs it. Second, the love they have for their siblings is immediate and instinctive, growing their little hearts outside of themselves- focusing them on another besides themselves. They have had to learn to share- attention, toys, time, food and responsibilities. The older two also know the two year old is watching and will repeat what he sees them do. They are more careful with their words and actions and monitor each other when the other is doing something that the two year old doesn’t need to be doing. Children, no matter how many you have, also force you to answer the ‘bigger’ questions in life that you may have put on a shelf. They ask. Everything. Like…What happens when you die? Where was I before I was in your tummy? How can God and Jesus be the same person, but not the same person (try explaining the trinity to a five year old)? Can two girls get married? What does it mean to be rich? Then, they require things from you without literally coming out and asking. Because I know I have little eyes watching, it forces me to dig deep and consider my responses. How do I handle my anger? How do I speak about other people? How do I handle it when things don’t go my way/ when my day falls apart? Do I share? When is anger appropriate and how can I display it without being destructive? 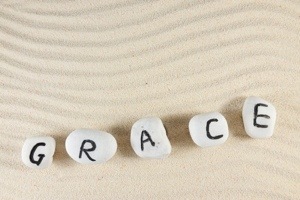 Love and forgiveness and the grace to keep trying each day. I’m thankful this year for so many things and so many people in my life. I’m thankful for my family most of all and for Katie and John and their children who are creating their own domestic Church, with the grace and blessing of the Lord at the heart of their home. Hoping you all enjoy a happy and holy Advent. Why is this happening? Are Catholics using artificial birth control? Undoubtedly. Are Catholics having abortions? Tragically, yes. In the generation since Humanae Vitae (1968) it’s becoming hard to distinguish Catholic families from others, at least based on the number of children they have. And if we, as a Church, aren’t open to he gift of life, are we really Catholic anymore? Perhaps you’ll disagree with me. Surely artificial contraception can’t be that important. Yet we know that it was the Blessed Virgin Mary’s openness to the gift of life that allowed Salvation to be born. A contraceptive mentality, in contrast, puts “me” at the center of things and not God’s will for my life. It takes God out of my most intimate relationship with my spouse and it degrades our shared intimacy into mere self-seeking pleasure. This same mentality will seep into the other areas of our lives making them, as I see it, smaller and duller and more limited. And sad. Next time I’ll be sharing the insights and understandings of a young mother. My niece Katie and her husband John have four children under the age of ten. I think her words will touch your heart, as they did mine. As you gather together around your Thanksgiving table next week, take a moment to reflect on what your children mean to you and the blessings and challenges they’ve brought with them. What if your had more children? 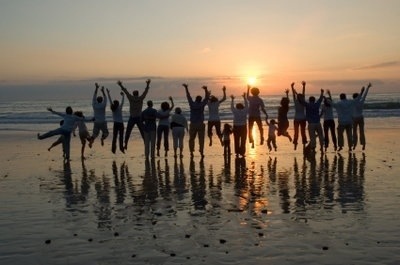 How would having a larger family have changed your life?